Feast your eyes on some of the world’s greatest scenery, cruise across lovely lakes, board the Glacier Express for the most scenic rail trip in Europe – winding its way through lush Alpine valleys dotted with picturesque villages. Spectacular lake and mountain views awe visitors staying at the Europe hotels in Switzerland. Hike or bike through beautiful panoramic countryside. Picturesque Geneva has a stunning of the lake and surrounding mountains. Shop in Les Rues-Basses, Geneva’s upscale shopping district. Explore Zurich’s beautiful view, multi-ethnic restaurants, and soak up the city’s urban buzz. 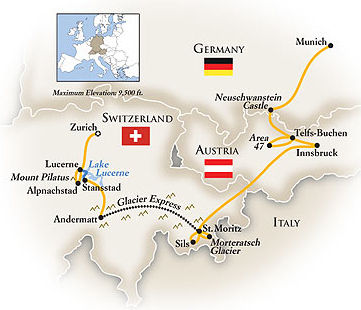 Experience this amazing adventure and the breathtaking beauty of the Alps of Switzerland, Austria and Germany! 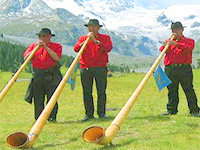 This alpine tour is filled with mountain discoveries and family fun…. Ride the Glacier Express through the Swiss Alps – and the world’s steepest cogwheel railway to the top of Mount Pilatus. Take a lake cruise across Lake Lucerne, challenge yourself at a suspension rope park, or go for a wild downhill ride on a summer toboggan run. Climb high up in the Engadine on a cable car and go mountain biking through the lake plateau to St. Moritz. 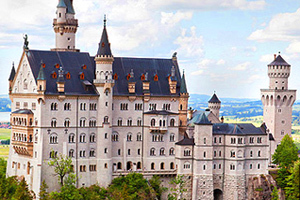 Ride a horse-drawn carriage to fairy-tale Neuschwanstein Castle in Bavaria. Welcome to the Swiss Alps! 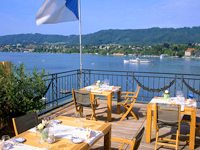 A transfer is included from Zurich International Airport to Palace Luzern. Settle into your historic grand hotel in the heart of lakeside Lucerne before kicking off a week of alpine family fun with a guided tour of the interactive Swiss Museum of Transport.. followed by a private welcome reception and dinner at the museum after it closes to the public! Feast your eyes on some of the world’s greatest scenery today… first on a cruise across lovely Lake Lucerne, and then aboard the famous Glacier Express for what many call the most scenic rail trip in Europe – winding its way through through lush Alpine valleys dotted with little villages… the real Switzerland! 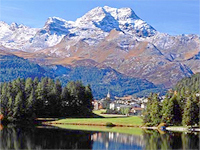 Arrive in the popular resort town of St. Moritz for a two-night stay in the Engadine Valley. Start another exciting day on your family’s alpine tour by climbing up an alpine peak via cable car. You won’t believe the views of the Engadine Valley and its many lakes stretching out below you. Then, if you wish, hop aboard a mountain bike for a ride back through the lake plateau of the Engadine to St. Moritz. Then, a hike across mountain terrain to the Morteratsch Glacier completes an unforgettable day in the Swiss Alps; your evening is free to do as you please in St. Moritz. You’ll say goodbye to Switzerland today as we head across the Alps into Austria. Arrive at Innsbruck – the 15th-century capital of Emperor Maximilian’s Habsburg Empire, and more recently the host of two Winter Olympic Games in the 20th century. Join your local guide for a walking tour of this idyllic alpine city, during which you just might “meet” old Emperor Max and his wives. The afternoon takes you to Innsbruck’s high-tech Bergisel ski-jump complex for a demonstration of the difficult and daring art of ski-jumping; spend the next two nights at your celebrated mountain resort in Telfs-Buchen in the heart of the Austrian Alps. Get wet and wild today in Austria’s Ötztal Valley during a trip to one of the largest adventure parks in the Alpine region, and Europe’s ultimate outdoor playground. Jump into a neoprene suit and helmet, and head out on a whitewater rafting adventure, and maybe spend some time on your own trying out the slides and other attractions of one of the biggest water parks on the Continent. Tonight, you’re off to the Ropferstub’m – an authentic mountain Hütte, or lodge, with amazing views of the surrounding peaks – for a special Alpine evening featuring local Tyrolean specialties, music, fun, games and more, all set around the warmth of a campfire! Depart Austria and cross the German border into Bavaria, where you’ll have an experience straight out of a storybook… a horse-drawn carriage ride to fanciful Neuschwanstein Castle for a guided visit. This grandiose castle in the mountains was built by Bavaria’s King Ludwig II in the 1880s, and served as the model for the castle in the animated Disney film classic Sleeping Beauty. Stop for lunch, then continue to Munich; your historic grand hotel in the heart of the city is a perfect base for exploring the Bavarian capital. Cap your memorable family Alpine tour with tonight’s farewell dinner at the Spatenhaus in Munich. Your alpine tour ends in Munich. Fly home anytime; a transfer is included from the Bayerischer Hof to Munich Airport.